Lately, for the Inspired by Reading Blog Hops, I've been posting directly to our Facebook page. But since I wanted an opportunity to blog more frequently, I decided it might be nice to revisit posting my projects here. If you're not familiar with our book club, it's a twist on a traditional concept. 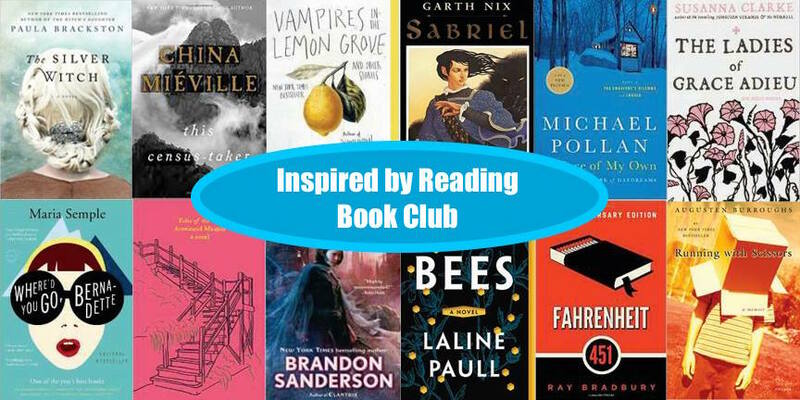 We pick a selection of books, read them, and discuss them just like any regular book club... except we take it one step further. Participants are asked to create something that they were inspired to create from what they read. It could be anything! Most of us are jewelry-makers, so there's a lot of jewelry, but every now and then we'll get a photograph or someone will bedazzle a shoe or create an intaglio print! For the current list of book club books, CLICK HERE. 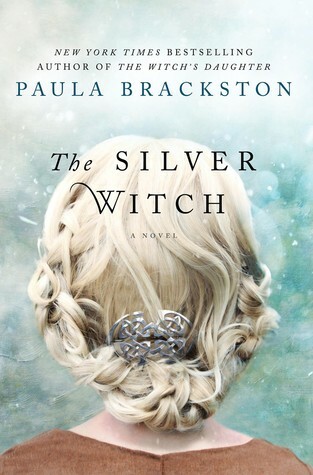 For August, we read "The Silver Witch" by Paula Brackston. It was an enchanting tale that wove together the lives of two women – a ceramist named Tilda set in modern times and a shaman named Seren inhabiting the ancient Celtic world. The story follows Tilda in a journey of self-discovery, overcoming fear and grief, claiming personal power, and how her fate is intertwined with the mysterious history of the Welsh countryside that she now calls home. Everyone at the meet-up agreed that they really enjoyed the book and found it loaded with juicy visuals to pull inspiration from. Many of the members said that they were so impressed with the book that they had started reading Brackston's other magically-oriented books. 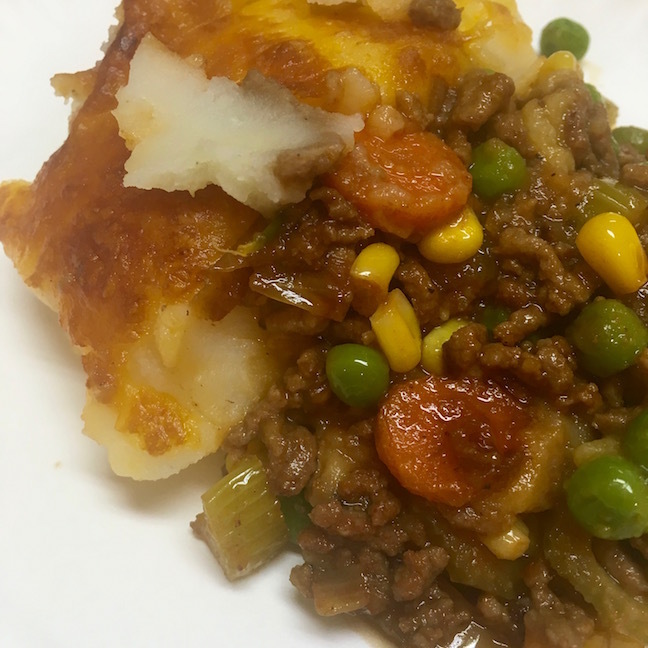 For our meet-up at Allegory Gallery in Ligonier, I made a Shepard's Pie. One of the characters orders it at the Red Lion Pub featured in the book and I thought it would set the mood as well feed our appetites. Alison brought ice cream for dessert and Dawn came prepared with our customary "book club moscato". The author included a reading guide on her website, so we discussed the questions and shared our thoughts about the book. Of course, we had fun catching up on current events and the like! For my project, I created a necklace. The base of the necklace is wire-wrapped tourmaline rondelles. I thought it represented the silk bag Seren is given that is embroidered with gold thread. The leaf charms are fine pewter and come from my family at Green Girl Studios. To me, they symbolized the secluded forest where Seren has her home. 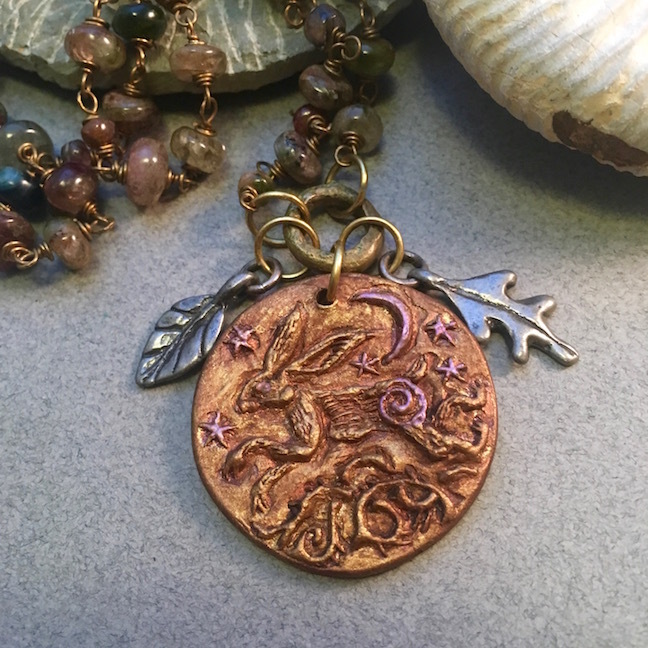 The focal pendant, featuring the running hare at night, is one that I made from polymer clay and painted with alcohol inks and acrylic paints. I had wanted to do it in bronze clay (to look like ancient gold), but I didn't get a chance to make them before I did my last firing. So that will have to wait. It ended up working out though, because I think I'm going to carve the mold again. I like most of the pendant... except, I messed up the back legs. I was carving in reverse, using a reversed image and it got twisted up in my mind. Sometimes you've just got to roll with it and carve what you see and not overthink it in your head. I'd also like to make the knotted brambles a little more stylized and more Celtic feeling. Either that, or leave them out entirely! It's a good thing the prototype is in polymer and not in bronze! The book is loaded with animals with special significances and this is a representation of the Hare. To see all the other great creations inspired by "The Silver Witch", CLICK HERE to visit our Facebook page. Ohhh I have to now check out these books by her this sounds so interesting... is there also an online join in for the book club??? Sorry pre coffee here :/ fantastic blog as always.. keep them coming.. thank you for always setting such a magical scene for us Andrew!!! I love your hare pendant, Andrew! And it's so nice to see a book club post from you after so long away from it... (it's nice to "hear" you more often on your blog in general!) I would love to see your next version of the hare carving... that one goes on my want list for sure! I like it the way it is. Still, if you have a vision then I encourage you to follow it. I am always happy to see what you've created. I love this necklace. So pretty and a little magical. I also will be interested in seeing the revamped carving. This one is already so pretty.